Germany is currently sliding into the worst recession since 1945, but its effects have not yet reached consumers, as shown by the astoundingly robust consumer mood of the past few months. However, it remains to be seen how the unemployment figures in 2009 develop and whether the rescue package of the German government will have a sustained effect. As Max Frisch, writer and Büchner prize winner once said: “crisis can be a productive state. We just have to take it as the aftertaste of disaster.” But where should consumers and entrepreneurs find the optimism that Frisch demands? Given the daily horror stories of DAX collapses, economic slumps and company bankruptcies, it is hard to imagine a relaxed 2009. The crisis is here and Germany is sliding into the worst recession since 1945, but its effects have not yet reached consumers, as shown by the astoundingly robust consumer mood of the past few months. The reasons for this lie in the high wage agreements and the low price level of many products. These include petrol and heating oil, among others. The inflation rate is also having a positive effect. It has remained relatively low this year and is not likely to exceed 0.5%. Additionally, some industries definitely have reason to look to the future positively. 2008 was the best year in a long time for food retail. For the first time, consumers spent more on food and toiletries than non-food articles such as textiles and electronic items. 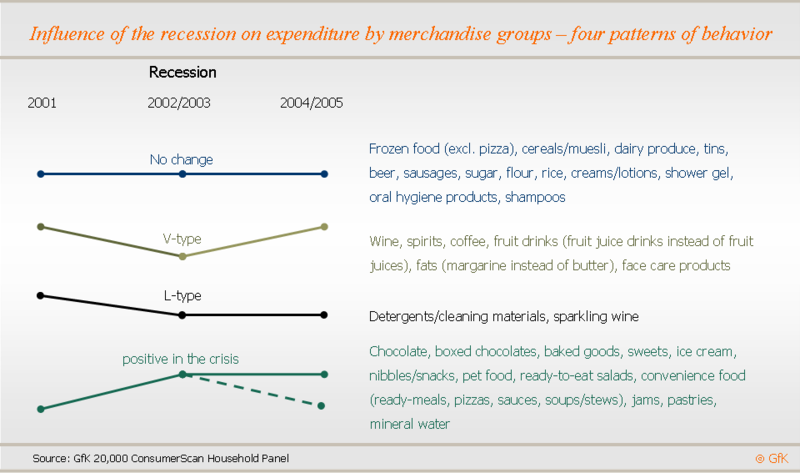 For 2009, the GfK consumer experts predict spending of approx. EUR 154 billion in food retail. Non-food retail (electronics, hardware, textiles), on the other hand, will come off significantly worse at EUR 145 billion. This is shown in the results of surveys by GfK ConsumerScan and GfK ConsumerScope. What hinders one helps the other. Sales in the catering industry fell by at least 7% in December 2008 according to the survey “GfK TrinkTrends”. However, this should benefit the food industry, as experience shows that in times of crisis, consumers remain at home. “Cocooning” is the buzz word of the (crisis) hour. People are saving money by not going out, in favor of consumption in front of the TV. Manufacturers of chocolate, ready meals and soft drinks can expect rising sales. People are looking for the feel good factor at a minimal cost. The winners in the crisis are certainly the discount stores and trade brands. The latter have been able to expand their market share for many years, but the premium brands have also fared well, having kept their market share between 12% (2004) and the current level of almost 15% for many years. Naturally, low income households have not been and are not able to afford expensive products. However, the better off consumers in secure jobs or retirement, currently 46% of the population, are not giving up “their” premium brands even in the crisis. This group in particular values quality when shopping. 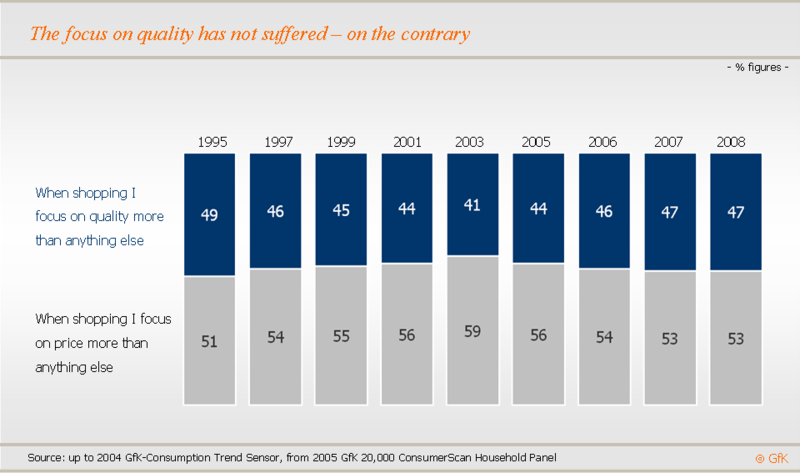 While quality was buying reason number 1 for 45% of consumers in 1999, this figure was 47% in 2008. However, consumers are now also paying more attention to the origin of their purchases, expecting not only quality but social responsibility, environmental awareness and carbon neutrality from their products. Staying at home is a trend that is also apparent in the vacation plans of Germans. In summer 2008, 42.9 million vacations were spent in Germany, according to the result of GfK TravelScope, a survey by GfK Panel Services Germany, which measures the travel behavior of Germans. Already, 2.5% more inland trips are planned than in the previous year. This trend benefits the food retail industry as well as the national tourism industry. If petrol prices remain low, Germans could spend their vacations traveling in their own car, which may be new thanks to the scrappage scheme. However, the growth of unemployment figures in 2009, the success of the rescue package by the German government in strengthening the economy and its benefit to consumers are currently uncertain. Until this is known, we cannot classify the crisis as a disaster yet. Smartiquette: Please keep it civil! Travel trends: We have lift off! What are our sources of entertainment? A mobile world – without mobile payments? E-commerce for everyday consumables: a niche or growing market? Sustainable consumption – merely a case of lip service? Where should we invest our savings? GM food: a blessing or a curse? Nutrition? A matter of taste! Can users protect their data autonomously? Online life: a (purely) private matter? Purchasing decisions: with help instead of alone? Do you have friends for life? What is the meaning of price? Living and working – is everything in its right place? Is nuclear energy on the way out? An extra helping of health? If you sign up here, we inform you as soon as a new Focustopic is available.